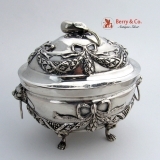 Italian solid silver sugar box with Repousse wreath decorations and applied mask with ring handles sitting on four lion and paw feet, c.1750. 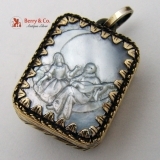 This beautiful box is 5 3/4" long, 4" wide, 5" tall and weighs 398 grams or 12.8 ozs Troy. The excellent original condition and clear, crisp detail, with no monograms, removals, repairs or alterations, make this an especially attractive offering. The soft, warm, original antique finish is present, with no buffing or machine polishing. American Federal coin silver helmet form creamer by Ebenezer Moulton, Boston Massachusetts, c.1800. 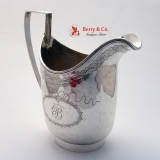 This handsome creamer is 5 1/4" tall, 5" spout to handle and weighs 152 grams or 4.9 ozs Troy. Monogrammed B in an ornate period script on both sides. The excellent original condition with no removals, repairs or alterations, make this an especially attractive offering. The soft, warm, original finish is present, with no buffing or machine polishing. 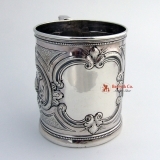 American coin silver octagonal cup with beautiful engraved scroll decorations, made by Eoff & Phyfe, c.1844-1850, N.Y., retailed by Gelston & Co. 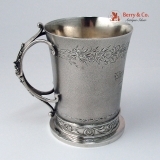 This handsome cup is 3 5/8" tall, 4" across the handle and weigh 158 grams or 5.1 ozs Troy. Inscribed J Edwards. The excellent original condition with no removals, repairs or alterations, make this an especially attractive offering. The soft, warm, original finish is present, with no buffing or machine polishing. 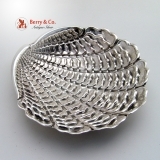 Buccellati sterling silver large Venus Shell dish. This magnificent dish is 6" long, 6" wide and weighs 200 grams or 6.4 ozs Troy. The excellent original condition with no removals, repairs or alterations, make this an especially attractive offering. The soft, warm, original finish is present, with no buffing or machine polishing. German 800 silver ornate goblet with applied oak leaf wreath cartouche, high relief grape decorations on stem, c.1896. 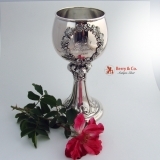 This beautiful goblet is 7 3/8" tall, 3 1/2" in diameter and weighs 193 grams or 6.2 ozs Troy. Inscribed MJd. 1. September 1896. The excellent original condition with some very minor wear consistent with age, no removals, repairs or alterations, make this an especially attractive offering. The soft, warm, original finish is present, with no buffing or machine polishing. American sterling silver large ornate cup with floral Repousse decorations, Vanderslice San Francisco, c.1875. This beautiful cup is 3 1/2" tall, 4 1/4" across the handle, 3" in diameter and weighs 186 grams or 6 ozs Troy. The excellent original condition with some very minor wear consistent with age, no removals, repairs or alterations, make this an especially attractive offering. The soft, warm, original finish is present, with no buffing or machine polishing. 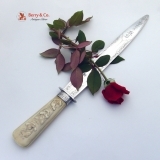 American sterling silver and walruses ivory large knife, special order Gorham Silversmiths, 1909. This magnificent knife is 14" long and weighs 177 grams. The handle features three carved monkeys, the blade has an acid etched Japanesque style decorations. The excellent original condition with some very minor wear consistent with age, no removals, repairs or alterations, make this an especially attractive offering. The soft, warm, original finish is present, with no buffing or machine polishing. 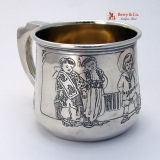 American sterling silver baby cup with an acid etched illustrated famous verse by Robert Louis Stevenson, made by Gorham Silversmiths, 1930-1940. This patriotic cup is 2 1/2" tall, 3 3/4" across the handle, 2 3/4" in diameter and weighs 108 grams or 3.5 ozs Troy. Inscribed on the bottom of the cup to Fredrick from the Stoody′s. The excellent original condition and clear, crisp detail, with no removals, repairs or alterations, make this an especially attractive offering. The soft, warm, original finish is present, with no buffing or machine polishing. 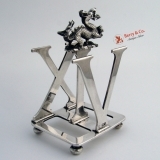 English sterling silver letter holder with figural cast dragon finial, London 1897 William Gibson & John Lawrence Langman. The slats for the holder are the letters XIV. This unusual holder is 4" tall, 2 5/8" long, 2 1/4" wide and weighs 163 grams or 5.2 ozs Troy. The excellent original condition and clear, crisp detail, with no removals, repairs or alterations, make this an especially attractive offering. The soft, warm, original finish is present, with no buffing or machine polishing. 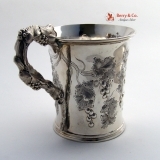 American coin silver large cup with beautiful grape and leaf chased decorations, Charters Cann& Dunn, NY 1849. This beautiful cup is 4" tall, 5" across the handle, 3 5/8" in diameter and weighs 198 grams or 6.4 ozs Troy. Monogrammed Joseph C Quinlan 1849. The excellent original condition and clear, crisp detail, with no removals, repairs or alterations, make this an especially attractive offering. The soft, warm, original finish is present, with no buffing or machine polishing. 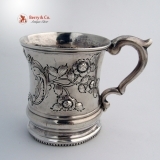 American sterling silver Mother Goose nursery Rhyme baby cup by Gorham Silver Smiths, c.1907. This beautiful cup is 3 1/8" tall, 4 1/8" across the handle, 3 1/8" in diameter and weighs 154 grams or 5 ozs Troy. Inscribed Katharine Alice June 22, 1907. The excellent original condition and clear, crisp detail, with no removals, repairs or alterations, make this an especially attractive offering. The soft, warm, original finish is present, with no buffing or machine polishing. American coin silver napkin ring with engine turned and a lake landscape scene decorations, c.1871. Unmarked but guaranteed to be as represented. This beautiful napkin ring is 1 7/8" in diameter, 1 7/8" tall and weighs 37 grams or 1.2 ozs Troy. Inscribed Mrs E Randall Aug 26th 1871. The excellent original condition and clear detail, with no removals, repairs or alterations, make this an especially attractive offering. 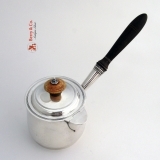 English Georgian sterling silver saucepan or brandy warmer with hinged lid on the spout by John Emes, London 1803. This elegant pan is 8 1/4" long across the handle, 3 3/4" long across the spout, 4 1/4" tall and weighs 328 grams or 10.5 ozs Troy. The excellent original condition and clear detail, with no removals, repairs or alterations, make this an especially attractive offering. American coin silver Christening cup with floral and scroll chased decorations, William Ladd, New York, c.1865. This beautiful cup is 4 3/8" long across the handle, 3" in diameter, 3 1/4" tall and weighs 122 grams or 3.9 ozs Troy. Inscribed Willie 1865. The excellent original condition and clear detail, with no removals, repairs or alterations, make this an especially attractive offering. 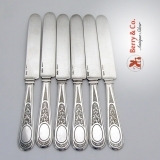 American sterling silver set of 6 flat handle breakfast or tea knives with hand engraved handles in the Ivy pattern by John Polhemus for Tiffany & Co., c.1870. These handsome knives are 7 5/8" long and weigh a total of 341 grams or 11 ozs Troy. Monogrammed SLM. The excellent original condition and clear detail, with no removals, repairs or alterations, make this an especially attractive offering. 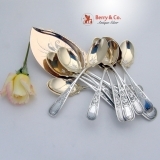 American sterling silver Ice Cream set 12 ice cream spoons and an ice cream serving spoon with beautiful hand engraved decorations on the handles in the Ivy pattern with Aesthetic engravings in the gilt bowls, John Polhemus, c.1870. 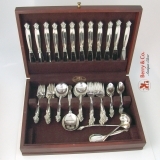 This magnificent set measures: spoons are 5 3/8" long, the server is 8 3/4" long, total silver weight is 248 grams or 8 ozs Troy. The excellent original condition and clear detail, with no removals, repairs or alterations, make this an especially attractive offering. 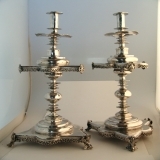 Spanish Colonial silver altar candlesticks in the Baroque Style, late 17th early 18th Century, likely made in Lima Peru. Each consists of three cast collars and a candle cup with a drip pan, a hollow ball and two platforms with Rocaille applied skirts, with winged and mask figures on each corner. The upper platform has a hand raised base. There is no filling or supports. The candlesticks are solid silver save for the threaded iron rod which attaches the assembly. All pieces are original. Each of these impressive candlesticks is 23 3/4" tall, with one weighing 3590 grams and the other 3560 grams for a total weight of 7150 grams or 229.9 ozs. Troy. 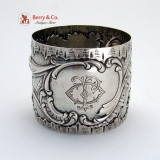 American coin silver Repousse floral, scroll and shell Baroque napkin ring, c.1875 having an ornate, period script monogram: JO. This elegant, ornate napkin ring has scrolling shell borders, elaborate floral, scroll and shell Repousse decorations and an elaborate scroll cartouche enclosing the monogram: JO. 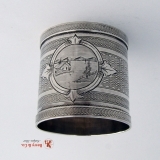 This very special napkin ring is 2" in diameter, 1 5/8" tall and weighs 30 grams. Monogrammed as described above, the soft, warm, original finish is present, with no buffing or machine polishing. The excellent original condition and clear detail, with no removals, repairs or alterations, make this an especially attractive offering. 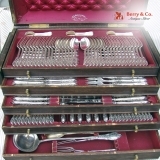 German 800 solid silver large and extensive flatware set with an original box, Wilkens & Sons, c. 1890. 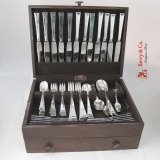 This beautiful set consists of: 24 Dinner Knives 10 3/8" 24 Dinner Forks 8 1/4" 12 Table Spoons 8 3/8" 12 Regular Forks 6 3/4" 12 Regular Knives 7 3/4" 12 Dessert Knives (all silver) 8 1/2" 12 Dessert Spoons 7" 12 Teaspoons 5 5/8" 12 Demitasse Spoons 4 1/4" 12 Fish Forks (all silver) 8 1/8" 12 Fish Knives (all silver) 8 7/8" Servers are: 1 Soup Ladle 14" 1 Pie Server 10 7/8" 1 Fish Serving Fork 10 3/8" 1 Fish Serving Knife 11 1/4" 3 Serving Spoons (Vermeil) 7 1/8" 3 Meat Serving Forks (all silver) 8 1/8" Total silver weight aprox. 250 ozs Troy. Each piece has AW initials. The soft, warm, original finish is present, with no buffing or machine polishing. The excellent original condition and clear, crisp detail, with no removals, repairs or alterations, make this an especially attractive offering. 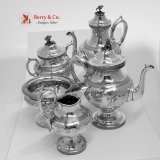 American 950 Standard Sterling silver 5 piece tea and coffee set decorated with floral chasing and engine turned borders and figural flower finial, Ball Black & Co, New York, c.1880. This beautiful set consists of: 1 Coffee Pot 13 5/8" 1 Tea Pot 10 7/8" 1 Creamer 7 5/8" 1 Sugar Bowl 10" 1 Waste Bowl 5 1/8" tall and 6 3/4" in diameter. Total Silver Weight is 126 ozs Troy. The soft, warm, original finish is present, with no buffing or machine polishing. The excellent original condition and clear, crisp detail, with no monograms, removals, repairs or alterations, make this an especially attractive offering. 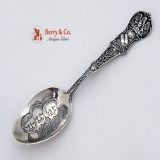 American sterling silver Black Americana Louisiana Souvenir spoon with three smiling black boys embossed in the bowl by the Watson Company, c.1900. This desirable spoon is 5 3/4" long and weighs 22 grams. The soft, warm, original finish is present, with no buffing or machine polishing. The excellent original condition and clear, crisp detail, with no monograms, removals, repairs or alterations, make this an especially attractive offering. 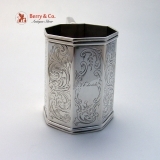 American coin silver napkin ring by Wood & Hughes c.1880. 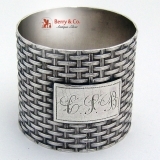 This attractive napkin ring has a heavily embossed allover basket weave design with an applied rectangular engraved border cartouche containing an ornate monogram CSB. Dimensions: 1 5/8" - 1 1/2", weight 36 grams or 1.2 ozs Troy. The excellent original condition and clear, crisp detail, with no removals, repairs or alterations, make this an especially attractive offering. Monogrammed as described above, the soft, warm, original antique finish is present, with no buffing or machine polishing. American sterling silver souvenir spoon of San Francisco California, c.1900. 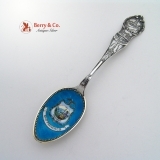 This glorious spoon has a beaded edge enamel bowl with a blue guilloche enamel background, a white enamel banner reading: San Francisco and an embossed shield shaped eagle topped cartouche with the Great Seal of California done in multicolored enamel. The front of the handle has the San Francisco City hall, the US Mint. Lotta′s Fountain and the Manila Monument. The back of the handle has A female warrior holding a spear ans shield, with a sheep, grapes and a sheaf of wheat at her feet and a plow behind her, with a ship sailing through the golden gate in the background. A full figured 49′er holding a pick and a gold nugget stand over a bunch of grapes and under oranges. This fabulous spoon is 6" long and weighs 32 grams or 1+ oz. Troy. The soft, warm, original finish is present, with no buffing or machine polishing. The excellent original condition and clear, crisp detail, with no monograms, removals, repairs or alterations, make this an especially attractive offering. Italian sterling silver service for 12 X 5 plus servers in the Empire pattern by Buccellati Silversmiths of Milan Italy, c.1960. 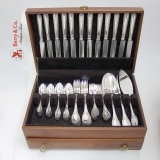 The set consists of: 12 Dinner Knives 9 7/8" 12 Dinner Forks 8 1/4" 12 Salad Forks 6 7/8" 12 Oval soup or Dessert Spoons 7" 12 Teaspoons 6 1/8" Servers: Pie or Pastry Knife all silver 10 7/8" Serving Spoon large 11" Serving Fork 2 Tine 10 1/2" Serving Fork large 10 1/4" Total silver weight approx 121 ozs. Troy, including knife handles. The soft, warm, original finish is present, with no buffing or machine polishing. The excellent original condition and clear, crisp detail, with no monograms, removals, repairs or alterations, make this an especially attractive offering. 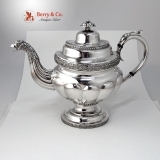 American coin silver teapot, New York maker, c.1825 - 1835, unmarked, possibly by William Thompson or Monell and Williams. This strikingly handsome, large teapot has a melon-reeded oval body on a stepped oval pedestal base; die-rolled floral, acorn, thistle and foliate scroll borders applied at the shoulder and edge of the base; Gadroon and beaded die-rolled borders applied at lip and top of base. The large flat hollow C scroll handle has a scroll and shell thumbpiece. Lid has concealed hinge and domed foliate finial. The fluted spout has a feathered large eagle head nozzle. Weighing 933 grams or 30 ozs. Troy, this special teapot is 10 1/2" tall, 13 1/2" handle to spout, with the body being 6 1/2" long and 5 3/4" wide. The soft, warm, original finish is present, with no buffing or machine polishing. The excellent original condition and clear, crisp detail, with no monograms, removals, repairs or alterations, make this an especially attractive offering. 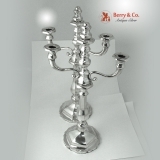 Austrian 800 standard silver three light candelabra, with both having their original removable finials which double as snuffers. Each of these large, impressive candelabra is 18 1/2" tall and 10 1/4" across the arm. The bases are filled, the removable arms are not. The soft, warm, original finish is present, with no buffing or machine polishing. The excellent original condition and clear, crisp detail, with no monograms, removals, repairs or alterations, make this an especially attractive offering. Shipping weight will be 12 pounds or less, with domestic shipping included in the price. Danish sterling silver 65 piece Arts and Crafts dinner flatware set in the Acanthus pattern by Georg Jensen, designed by Johan Rhode 1917, c.1945. This handsome set consists of: 12 Dinner Knives 9" 12 Dinner Forks 7 1/4" 12 Salad Forks 6 5/8" 12 Gumbo Soup Spoons 6 1/2" 12 Teaspoons 5 3/4" Servers: 1 Sugar Spoon 6" 1 Sauce Ladle 6 1/4" 1 Gravy Ladle 7 3/4" 2 Piece Salad Serving Set 8 1/8" Total silver weight: 86.3 ozs Troy. The soft, warm, original finish is present, with no buffing or machine polishing. The excellent original condition and clear, crisp detail, with no monograms, removals, repairs or alterations, make this an especially attractive offering. 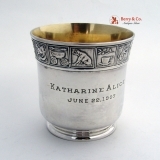 American sterling silver christening cup by Gorham Silversmiths, date marked D for 1872 and inscribed: Elizabeth Wilson Scranton from her Great Grandma. This truly elegant cup has a tapered, matte finished body with a wide band of engraved multi-floral, pine cone and foliate decorations just under the rim, a narrow band of engraved foliate decorations above the scroll and foliate raised base. The quadruple scrolling and elongated leaf form handle has a crowned mask and rising tendril blossoms, adding to the appeal of this special cup. Elizabeth was the granddaughter of the founder of Scranton, Pennsylvania and the daughter of one of the founders of the Lackawanna Iron and Steel Company. This large, attractive cup has a gilt interior and is 4 1/8" tall, 3 1/4" in diameter, 4 3/8" across the handle and it weighs 250 grams or 8 ozs. Troy. Inscribed as described above, the soft, warm, original finish is present, with no buffing or machine polishing. The excellent original condition and clear detail, with no repairs or alterations, make this an especially attractive offering. American sterling silver Arts & Crafts sterling silver 89 piece Dinner flatware set in the Chinese Key pattern by Allan Adler, c.1944. This handsome set consists of: 12 Dinner Knives 9 5/8" 12 Dinner Forks 7 1/2" 12 Salad or Smaller Forks 6 5/8" 12 Teaspoons 6" 12 Oval or Place Soup Spoons 6 3/4" 12 Demitasse Spoons 4" 12 Butter Knives 6 1/4" Servers include: 1 Sugar Shovel 6 1/8" 2 Serving Spoons 7 3/4" 2 Serving or Cold Meat Forks 8" Total silver weight 130 ozs Troy. The soft, warm, original finish is present, with no buffing or machine polishing. The excellent original condition and clear, crisp detail, with no monograms, removals, repairs or alterations, make this an especially attractive offering.